Do you have a chipped or broken tooth? Do you have mercury-silver fillings that show when you smile? Bonding is an affordable solution to help repair or enhance your smile. Dental bonding is when a tooth-colored composite resin is applied to your front teeth to fix problems ranging from chipped teeth, broken corners of your teeth, cavities, enamel defects, and replacement of silver-mercury (amalgam) fillings. During dental bonding, teeth are shaped and treated with an etchant prior to adding one or several layers of tooth-colored composite resin to repair/augment the teeth. This procedure is typically performed on front teeth. Dental bonding has also replaced the need for mercury-silver fillings. If you have previously had mercury-silver fillings, our Raleigh dentist at Russo Dentistry can safely remove these fillings, and replace them with natural-looking composite fillings and porcelain crowns. During the bonding procedure, Dr. Russo will apply a dentin bonding agent to the tooth, which etches and roughens the surface to help the bonding material stay in place. A putty-like bonding material is then placed on the tooth’s surface, where it is shaped and sculpted to look like a natural tooth. A special UV light is used to harden and set the composite material. Finally, Dr. Russo will polish and buff the tooth for a smooth finish. 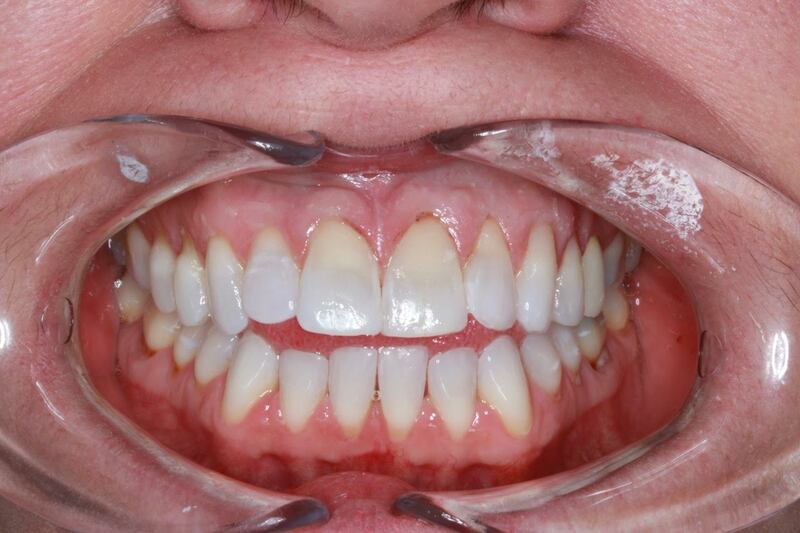 This patient came into the Russo Dentistry office embarrassed to smile, and within one hour, Raleigh Dentist Dr. Justin Russo was able to repair and recontour her front teeth. She was thrilled with the results. It’s that easy! For a beautiful and natural-looking smile in Raleigh, Russo Dentistry is the affordable solution for all of your dental needs.